On a fine frosty autumn evening at the beginning of October all the stars lined up for me for a Milky Way shot. Here I have the Milky Way at Two Medicine Lake in Glacier National Park. Mt. Sinopah reflects in the calm waters of the lake, as do the stars of the night. On a fine frosty autumn evening atthe beginning of October all the stars lined up for me for a Milky Way shot. 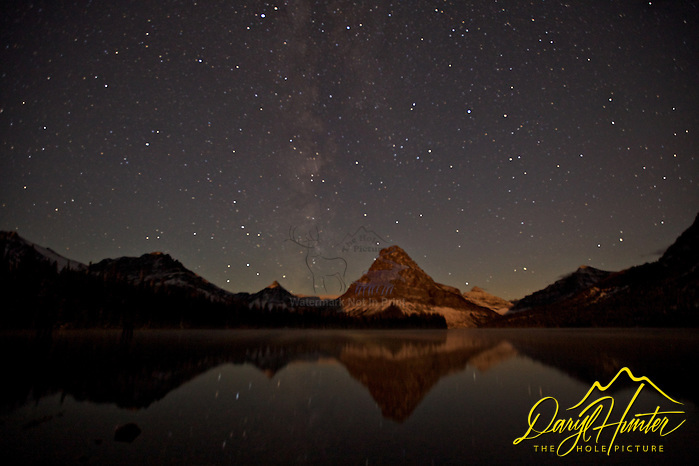 Here I have the Milky Way at Two Medicine Lake in Glacier National Park. Mt. Sinopah reflects in the calm waters of the lake, as do the stars of the night. I find these opportunities quite problematic; you are shooting a landscape at your widest aperture so there is very little depth of field. What do you focus on? Once you figure that out you can’t see what you have decided on because it is darker than the resulting photo. Here I was shooting at F 2/8, ISO = 1600 I still had to make exposures at 30 seconds. At this slow speed the stars move and get slightly oval. The sweet spot of the lens in the middle records the stars better than the periphery of the lens. Here Mt. Sinopah isn’t in focus, I can’t remember if the mountain was my focus point or not, I think I was focusing on the stars because of previous attempts. The Milky Way circles around the sky so it rarely lines up when I am hoping to compose it into a landscape so I don’t get much practice on these shots. In post processing I cleaned up with the cloning tool the deformation of the moving brighter stars. Did I mention that is was seventeen degrees? I think I can blame the lack of clarity on the tripod being so cold it was shivering. Posted on Friday, November 16th, 2012 at 8:56 am. Filed under: Photography, Photograpy Tags: east glacier, Glacier National Park, how to, lewis range, Milky Way, Milky Way Reflection, montana, Montana sky, Mt. Sinopah, night photography, night sky, stars, stary night, two medicine lake	RSS 2.0 feed.